---when you are trying to tune a pedal by tightening the nylon tuning nut for more raise or more lower, by the time you get to pitch, the open string is no longer in tune when you release the pedal. So you retune the open string and now the pedal is no longer in tune. So you retune the nylon tuner. Then retune the string.....ever watch a dog chase its tail? That. ---you just can't get it to pull to your target pitch no matter how much you turn the nylon nut. The changer must be at rest when the pedals are not engaged. 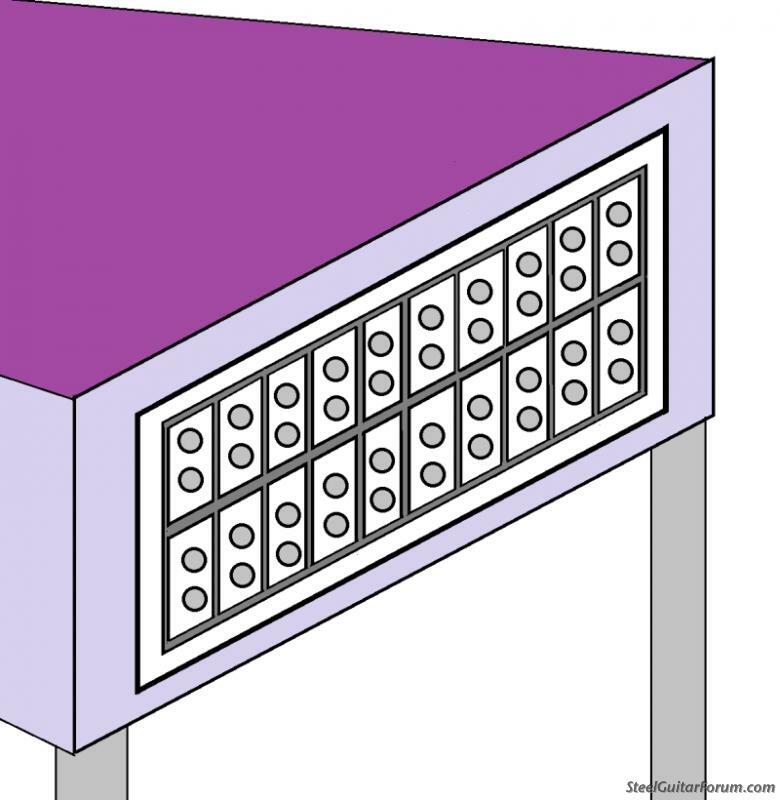 The changer fingers must be sitting at their stops -- their resting place -- at the end plate. They should appear all lined up in a row with none of them slightly indented. Here we see that the 4th string is coming back sharp. So we retuned the string. Now the lever isn't raising the string enough. So we tightened the lever more.....we've got problems. The pull rods with nylon tuners must have a little bit of play in them. This is a situation where tight and wiggle-free is NOT a good thing. When the pedal is depressed, the pull rod pulls the changer finger away from its stop. When the pedal is released, the changer finger must return to its stop. It cannot be left hanging on the nylon tuner. THIS IS CRUCIAL. 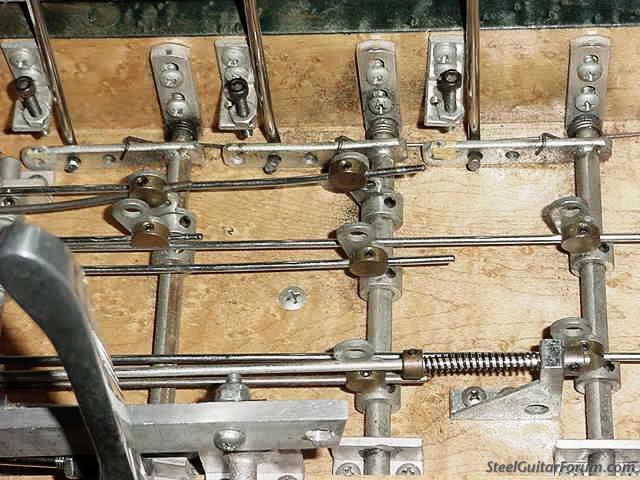 AN ALL-PULL PEDAL STEEL WILL NOT PLAY WITH RELIABLE REPEATABILITY IF THE CHANGER HANGS ON THE NYLON TUNERS. 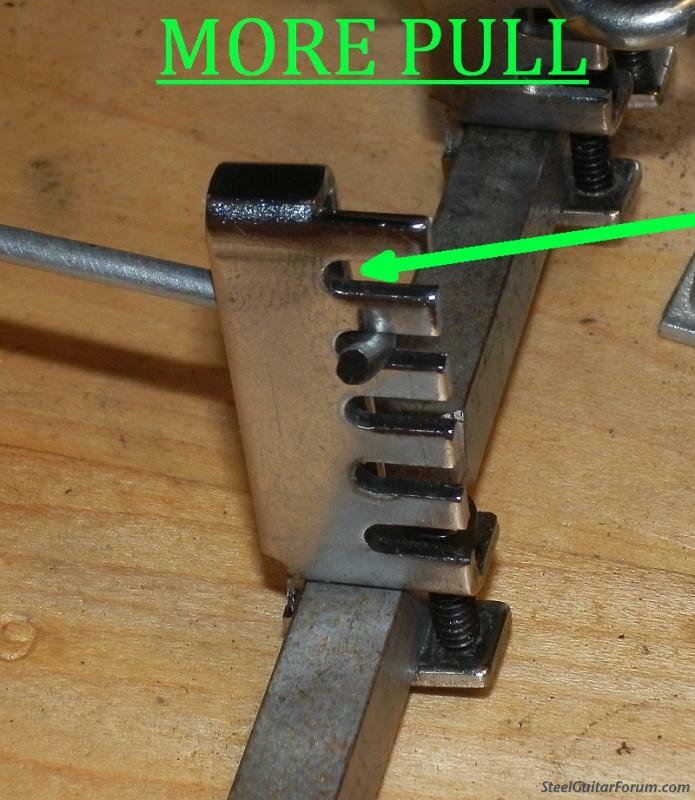 If you are tuning the pull and you tighten the nylon tuner more and more but cannot get the pedal to its pitch before the open string starts to change, the problem is that the pedal is not creating enough rod movement. So------first, back off the nylon tuner until the finger is at rest. It always comes back to this. --- increase the amount of rod movement you get per inch of pedal movement by changing the leverage of the pulling system. For a pedal, find the thing that stops the pedal at the end of its stroke. It may be a screw/bolt right where the pedal rod attaches to the cross shaft or it may be a small set screw in the front apron. Or it may be a fixed, non-adjustable stop. It may be the starting/resting point that is adjustable. Whichever method is used, by making the stroke longer you get more pull at the changer. These are Sho-Bud pedal stops. Unscrew the screw, get more pedal travel. Now try to tune the nylon nut and see if you have enough action to get to your pitch without overtuning the nut. This pedal (Fessenden) does not have an adjustable stop but it has an adjustable start. Unscrew this screw to gain more throw and more pull. 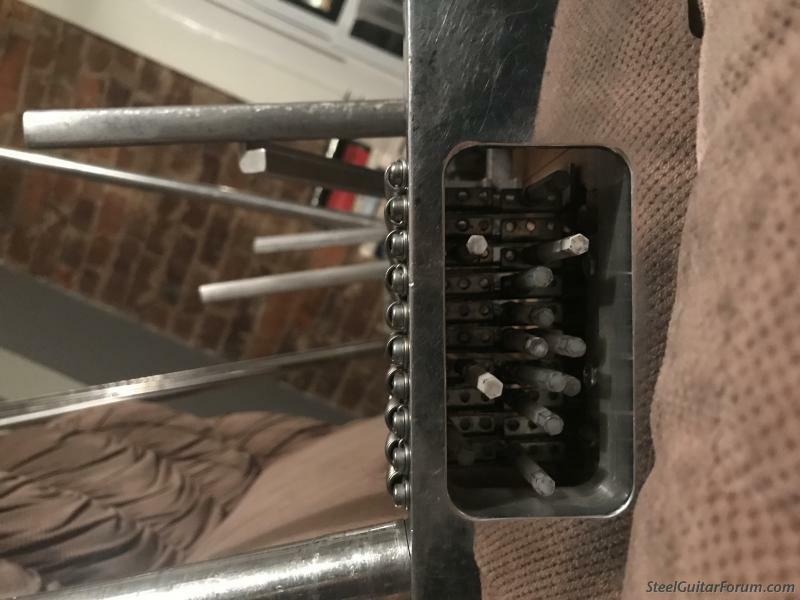 -----the hole or slot in the bellcrank that is selected for the pull rod is a major factor in the amount of pull you get out of your pedal movement. A hole closer to the cross shaft gives less pull, a hole farther from the shaft gives more. 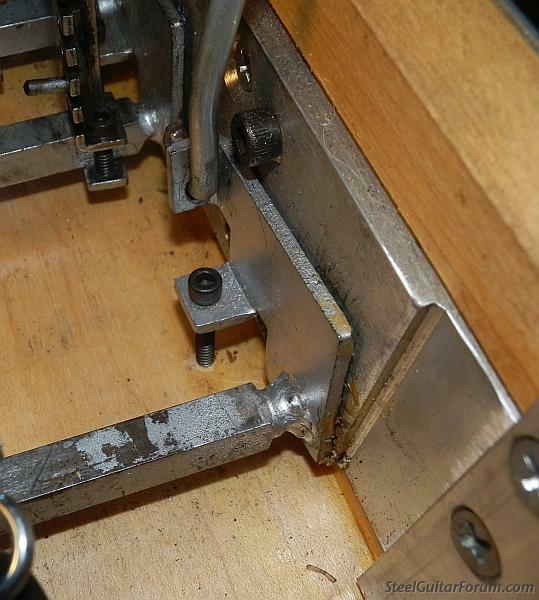 If you need more pull at the changer for the same amount of pedal movement, move the pull rod to a better hole. -----the hole in the changer finger is also a factor. It works in the opposite direction of the bellcrank holes. The hole closer to the top of the guitar gives more pull. If you have a mental grasp of leverage, that is what's in play here. (If not, don't worry about it). There are a bunch of other reasons to choose one hole over another when setting up a steel guitar from scratch and these factors should be considered when changing things. 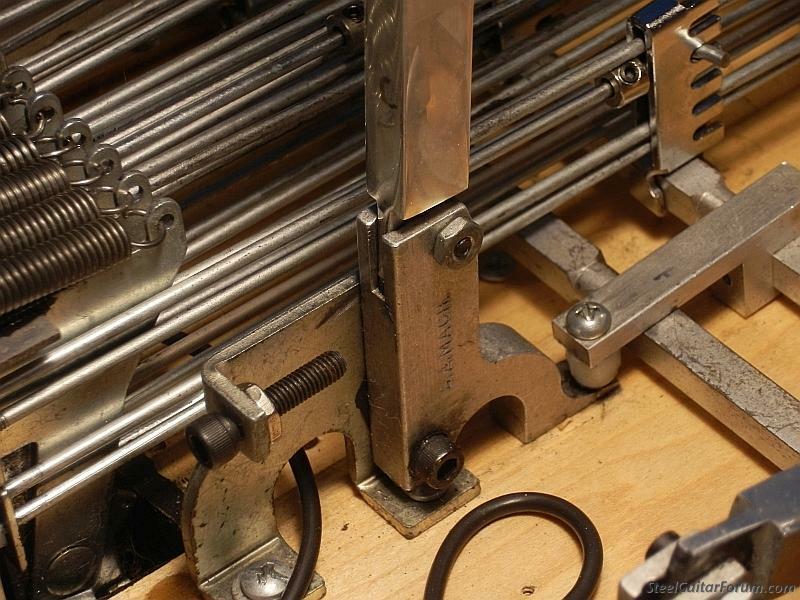 Routing rods so that they do not interfere with other rods, selecting holes to synchronize two strings on the same pedal so that they start and stop their pulls at the same time (different gauge strings have different needs) and synchronizing pedals so that they feel in sync with one another in terms of pressure and start/stop heights----these are all considered when assembling a guitar. Choice of hole at bellcrank and at changer will be a factor in how heavy or light the feel of the pedal/lever is. This is a more advanced level of adjustment that can be tinkered with once you have a good feel for the other mechanical issues. But it must be secondary to the essential issue being discussed here. A pedal steel guitar that will not reliably return to pitch is all but unplayable and the cause is so frequently overtuning that this should be the first thing to check for. Repeat: does the nylon tuner (no pedals or levers engaged) depress the changer finger (the thing with the holes in it) or is there a little bit of slack in the rods (as there should be)? This must be the first thing to inspect for if the guitar is inconsistently in/out of tune with pedals up, pedals down or both. I welcome corrections and clarifications. I have already made it more boring than I'd like it to be but I hope it can be a go-to source for what I observe to be the #1 most common issue with misadjusted all pull guitars. Before you buy and change strings for the first time, take note of whether the 6th string is wound or unwound and be sure to replace it with the same. One of the best posts I've seen. Thanks, Jon. Excellent presentation, Jon, thank you! 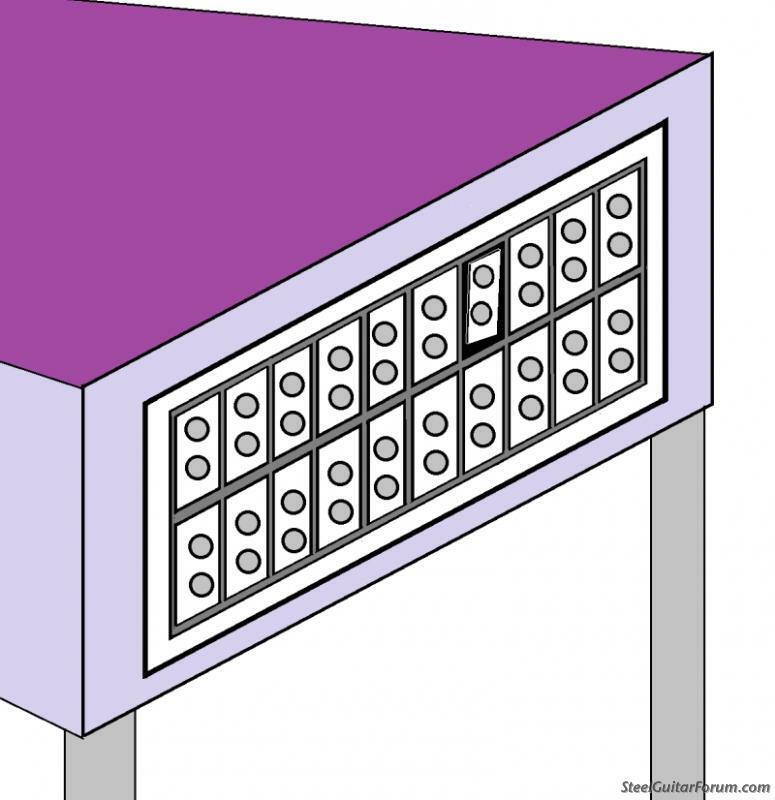 Maybe b0b can make this a sticky along with the guide to tuning push-pulls. Very helpful , just hope I can find this post if I ever need it . Sticky B0B ? Jon lives about 30 miles away from me" over the river and through the woods" kinda,and has saved my musical life two times,I would be totally sunk without Jon's expertise,He has vast knowledge of different systems etc,and a great guy. Ok, Ok, I'll buy you that beer, Stu. Thanks for the comments and thanks, b0b, for pinning this. Anyone with tuning problems with their steels and uncertainties about what I've tried to describe in this post--ask away. My best efforts at simplifying things still often bog down in my communications style and I'm sympathetic to anyone who can't quite get what I'm trying to explain. I'm no newby but I can see I've been just shooting in the dark with this. Thanks so much for taking the time to clear some of this up. Glad this was of some benefit to you. Great informative post. I'll save it for future reference. Thanks Jon. This should be required reading for all newbies. I understand people who would rather not have to know this stuff and that's fine. But I hope that after you get yourself into tuning stability problems, you can look this over and maybe get yourself out of trouble. -- Dirt & old gunky oil can gum things up and that's a whole different issue. -- A loose bellcrank is another thing to check for. Grab each bellcrank and wiggle it like you are looking for a loose tooth. This is a very real issue and can cause erratic tuning problems. -- binding cross shafts.....if there is no side to side play, these can cause trouble. Seasonal humidity changes can cause overly loose and overly tight cross shafts. Different steels have different remedies for this. That was an excellent tutorial of how to understand and resolve some common tuning issues. I know I've had my fair share of them throughout the years. Thank you for posting this guide. I’m sort of learning the mechanics of this from scratch as I ran into an issue today where the lower of the two E’s wasn’t reaching pitch on the Eb lever. I backed it off to the point at which it no longer affected the string and I unscrewed the screw underneath (mine has the Fessenden example). I’m fully out of my element and now the higher of the two E’s is affected drastically and I can’t get the lower to respond. I feel quite dumb as I don’t even know the right words to use to explain my predicament, haha. It is a Lone Star steel guitar built in Solado, TX. As for the model, I purchased this from Louis Meyers who said he had it custom built to fit in the overhead compartment of an airplane, it’s a keyless style. 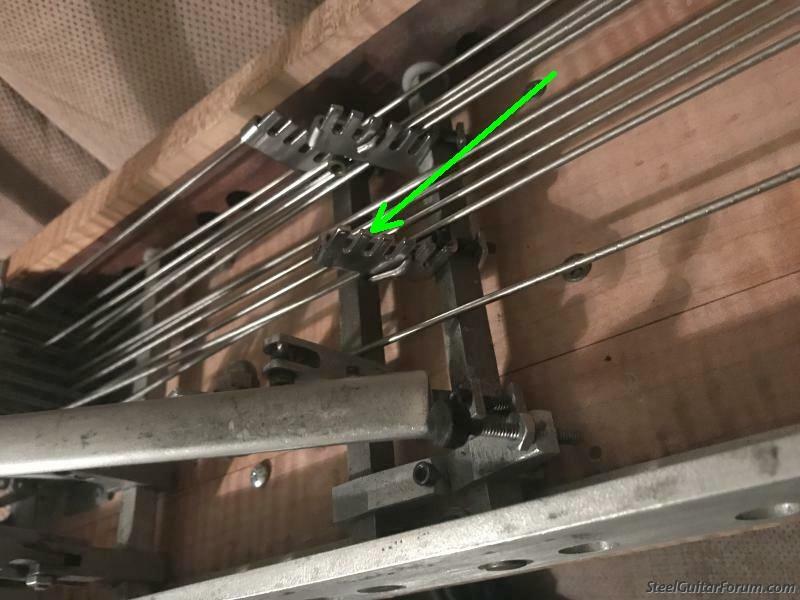 When I was tuning my Eb lever, the eighth string was no longer dropping far enough to reach pitch and adjustment either direction had very little affect. I loosened the lower screw on the undercarriage, the starting point screw?, and adjusted the nylon nut further however it caused a much more extreme travel and the 4th string was overbending. I so much prefer having my hands on but that ain't gonna happen. How about bringing that adjustment screw some (or all) of the way back to where you started and moving the pull rod to a higher crank position. Of course I have no way of knowing what you've already tried, where you've already been. This is great stuff! Thanks Jon! I returned to this block of instruction yet again this morning. Solved my problem in hours flat. ( Nah, just took a refresher and now it's all good once again.). What I don't get is how an old guitar can play and play for years then you set it up for a little gig and its out of whack. Are there steel guitar gremlins that hack into the case to mess with em? I've often suspected such but can't catch em. I think slack is the key, Bill. In life as well. Are there steel guitar gremlins that hack into the case to mess with em? Yes. Yes there are. My arrangement with them is that I do not publicly dwell on that subject here on the forum and they do not cut off all my strings overnight. Thanks for this great tutorial, Jon! It helped me set up my new (to me) Mullen SD-10 and tweak my old standby D-10 Mullen. Your info made it a piece of cake! Thanks for the feedback, John, and glad that this was of assistance. As you see, this-all applies not only to fixing problems but also to sweetening up the action of a steel, getting it playing at its physical best or tweaking it to your personal preferences or long/short, easy/stiff.